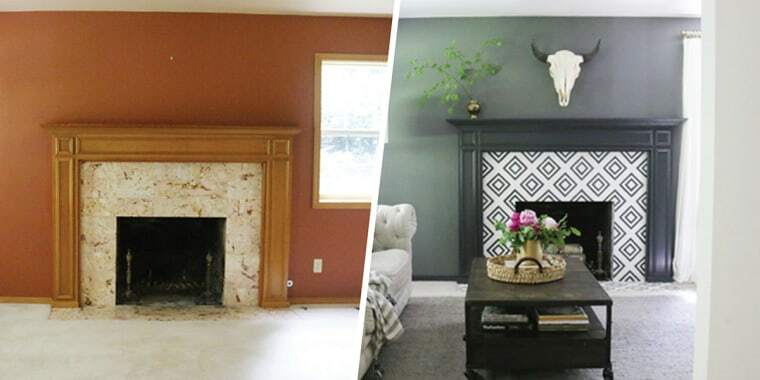 See this fireplace go from drab to dreamy after a makeover — that was nearly free! Until she's ready to pay for a more permanent renovation, this homeowner created a stunning fireplace with a little DIY trick. You may have seen paint transform a room before, but have you ever seen it transform a fireplace? Emily Lex purchased her home in Gig Harbor, Washington, in 2016 and has always planned for larger renovations in the future. But the 39-year-old blogger and graphic designer wanted to update the look as much as possible to help it look modern in the meantime. Lex opted for a fresh coat of paint on the walls and created an intricate pattern with paint on the fireplace — and we had no idea it could work quite this well! "Because this fireplace is something we'll eventually update, I wanted to try making it over without spending a fortune," Lex told TODAY Home. "I searched through photos and cement tile websites until I found a pattern that I fell in love with." Lex knew that she could re-create it using paint — and that's just what she did. "I painted the existing granite tiles with regular household latex paint, then penciled in the lines and hand-painted with black chalk paint," said Lex. "It took a few coats of paint over a few days, and turned out even better than I imagined." The results are stunning — and the cost? Practically free! Lex explains that she had all of the paint (and even the paint brush) on hand. "I do love how the fireplace pops against the dark walls," said Lex. "It is unexpected and adds some whimsy to an otherwise pretty traditional room." Lex explained that she wanted the room to be "cozy, moody and a place for more intimate gatherings" for her large family. "The best part about this room makeover is that all we did was paint," said Lex. "It just proves that it doesn't take much to update a room."